We welcome this latest research on the under-researched Cayman Islands, an Offshore Financial Centre (OFC) ‘with foreign assets amounting to over 1500 times Cayman’s domestic economy.’ As we so often explain, while Switzerland currently tops our Financial Secrecy Index, if the UK and its Crown Dependencies and Overseas territories were all rolled into one and assessed together, the UK would in fact be number one in terms of the world’s most significant offenders. And the Cayman Islands is a prolific contributor to that dubious pedigree. We rank the British Overseas Territory of the Cayman Islands as number five in our 2015 Financial Secrecy Index, which combines a secrecy score with a global scale weight in financial services exports. (You can read Jan Fichtner’s full paper ‘The anatomy of the Cayman Islands offshore financial center: Anglo-America, Japan, and the role of hedge funds’ here – open access until December 2016!). The Cayman Islands is a tiny archipelago south of Cuba with roughly 50,000 inhabitants and a GDP of only about US$3 billion. In most measures of international investment and banking, however, Cayman is among the five largest global jurisdictions. In fact, when excluding long-term Treasuries (of which China and Japan hold a huge amount), Cayman shows up as the largest holder of US securities in the world. How can that be? In a recently published paper in the Review of International Political Economy, I have compiled the first “anatomy” of the Cayman offshore financial center (OFC), utilising all sources of publicly available data about the three main segments of banking, direct investment, and portfolio investment (unfortunately, there are no data available on trusts). In total, foreign assets in Cayman amount to the staggering value of over US$4,000 billion – more than 1,500 times the GDP of this small group of islands. This dissection of the Cayman OFC shows that the United States is the largest counterparty in all segments. with Japan playing an important role too. 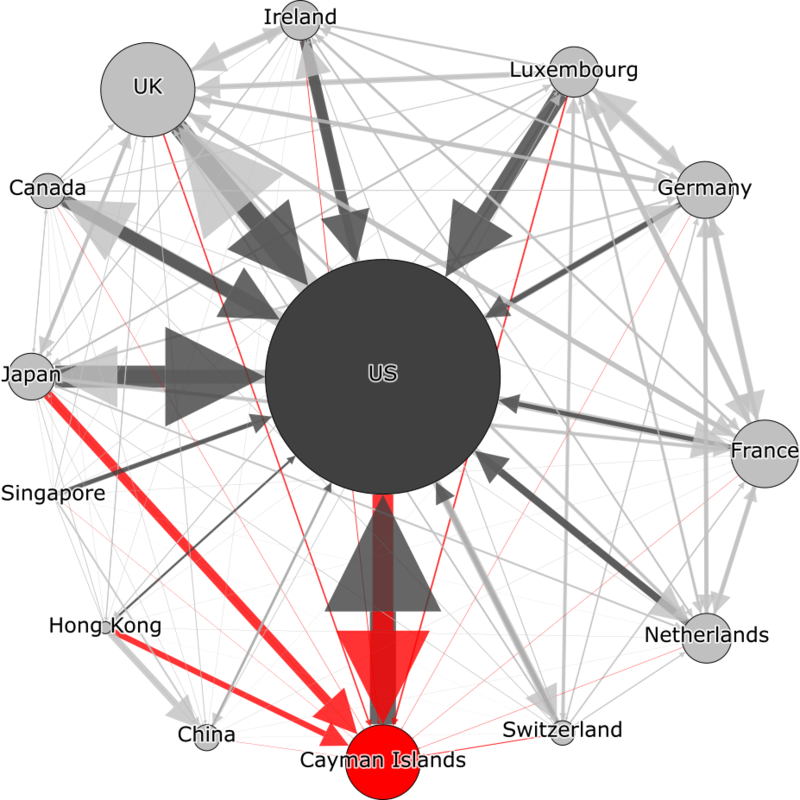 The figure below – a novel visualisation of portfolio investment relations between the largest jurisdictions in global finance – shows that investment into Cayman mainly comes from the United States, Japan, and Hong Kong. Cayman outward portfolio investment, on the other hand, basically has only one destination: the United States. Hedge funds are the main factor for this strong Cayman-US link in cross-border finance. Incredibly, about 60% of all global hedge fund assets are legally domiciled in Cayman – an extraordinary spatial concentration in such a tiny jurisdiction. The British Virgin Islands with 14% and the US state of Delaware with 12% are also significant legal domiciles for hedge funds. The vast majority of global hedge fund managers is concentrated in New York and London. So, why are these funds legally concentrated in a tiny remote jurisdiction in the Caribbean? In most media reports on the Cayman Islands, this jurisdiction is portrayed as an independent country. However, this is not the case. Cayman is a “British Overseas Territory”, which means that George Town has internal autonomy in matters of taxation and regulation, but London is responsible for international affairs and defence. In fact, it is still legally correct to refer to the Cayman Islands and other British Overseas Territories as “colonies” of the UK. Arguably, this legal status is crucial because it provides political stability and guarantees a stable legal system based on English common law – two fundamental factors that guarantee the trust of international investors. At the same time, this status allows Cayman to create a tailored regulatory environment that mostly satisfies internationally required minimum standards, but that also allows foreign financial actors to minimise taxes and regulations elsewhere. The big four accounting firms as well as bankers and lawyers from Britain, Canada and the United States have also played an important role in developing Cayman as a key global OFC. The main conclusion of my research is that one plausible explanation for the unparalleled rise of the Cayman OFC is seeing this jurisdiction as one node in an Anglo-American financial triangle together with the USA and the UK, Cayman’s sovereign power.